POLL: Will you go to the new water park at Lake Winnie? * Cost: Owners will say only it is a "multimillion-dollar expansion"
* Admission: $26 for all-day pass this year. Next year, admission to both parks will be by single ticket, cost to be announced. A new five-acre water park at Lake Winnepesaukah will feature seven water slides, a lazy river and room for parents to stretch in the sun. The as-yet-unnamed water attraction will mark the first phase of at least three that could stretch to 15 acres over the next few years -- the largest expansion of the North Georgia amusement park since the 1960s. Construction will bring 100 temporary jobs, and the water park itself will add at least 50 seasonal jobs, the owners said. Though the Rossville park's family owners declined to specify the project's cost, Dixon family member Adrienne White Rhodes said the new construction would bring "hopefully a lot more than 100,000" new visitors per year. Attendance so far this year totals more than 300,000. "Attendance will increase considerably," she predicted. Workers will complete the aqua expansion in summer 2013 after breaking ground in the first week of January, said Talley Green, part of the family's fourth generation of leaders. "We decided to do more than just add some rides this year," Green said. "We decided to kick it up a notch." The park sits on about 80 acres around the lake, with the eastern half used for rides and attractions. The entire western half is a blank slate, aside from employee parking and part of a roller coaster. To the southeast lies a 170-acre tract along Lakeview Drive, but it is mostly wetlands and would be difficult to develop, officials said. The challenge of how to build an entire amusement park in just a few months falls initially to Chris Jones, a Palm Beach, Fla.-based architect. 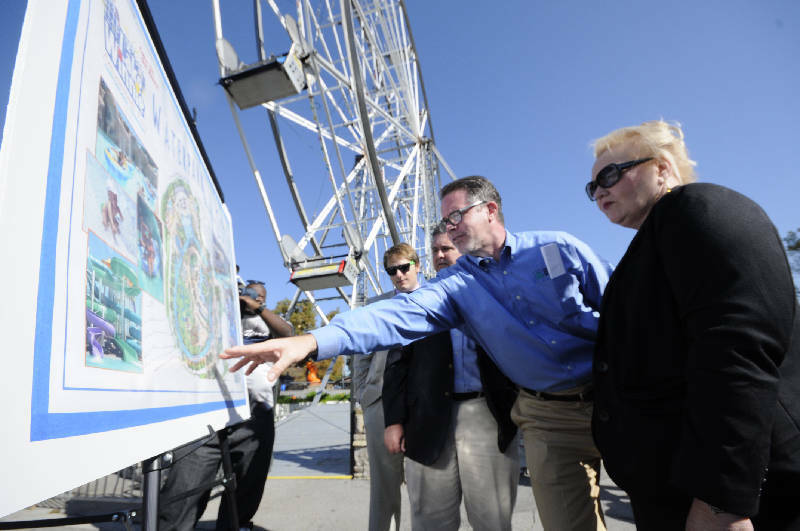 Along with contractor Aquatic Builders, which has created water parks for Six Flags, Dollywood, Disney and others, Jones helped draw up the water park's master plan. "There won't be high-thrill rides initially, but there eventually will be," he said. "All parks start small like this and then build up as time goes by." He agreed to come on board only if the family agreed to "do it right" and invest a significant amount of cash, Jones said. Part of that investment will go into building a small mountain in the southwestern corner of the property so the water slides can use gravity to their advantage. "You can't put together two Slip 'n Slides and a lawn sprinkler and call it a water park," Jones said. For the alcohol-free family park, the announcement marks a return to its wet roots. Lake Winnie, as it's commonly known, got started in 1925 with what was then the largest swimming pool in the southeastern United States, said Tennyson Dickinson, who helps run the park with Green. In 1927, the park installed the Boat Chute, which officials say is the last water feature of its kind still in operation. Over the years, Lake Winnie switched to dry rides, growing to 100 acres and 40 rides, including the wooden Cannon Ball roller coaster that will overlook the new water park. Lake Winnie is part of an increasingly rare contingent of two dozen family-owned and operated parks across the U.S. that offer good, clean fun, said Jim Futrell, historian for the National Amusement Park Historical Association. "They've been able to successfully deal with issues like family succession, aging infrastructure and changes in the neighborhood to adapt and remain relevant in the 21st century," Futrell said. The parks that survived the recession, like Lake Winnie, focused on the family crowd and stayed away from big spending projects, he said. But most already have installed water park attractions, which are inexpensive to build and maintain compared to traditional roller coasters. Water parks also help maintain attendance on particularly hot summer days, helping smooth out sales. "A lot of parks, when it gets above 90 degrees, people don't want to walk around in the heat," Futrell said. "The water park still brings those people in."